I woke up in a hurry. Nervous energy coursed through my body. I spent my morning rushing to getting the house looking perfect. I was so happy that I didn't even mind vacuuming for the third time that day. I fixed the kid's lunches early. The hours ticked by slowly, but then faster and faster as the time drew near. I was busy preparing when the phone rang. He must be on is way home!! I thought. My husband was coming home. Was it good or bad? I asked. I couldn't wait for him to tell me in person. My heart stopped as he told me. I stood frozen in the middle of the kitchen. The chaos of kids still rushing around me. My world was crumbling right then and there. I lost my job. Those four words echoed in my brain as I tried to comprehend. I began to cry on the phone. I hung up, not knowing what to say and not wanting him to know how upset I was. I quickly dialed my mom's work number. I began crying almost immediately on the phone. Oh my goodness, she said when I finally was able to tell her. I'm just glad no one is hurt. But I was hurt. I was in shocked and utter disbelief. Of all days. The day of our very first home study meeting for our adoption. A stranger was coming to our house to make sure we were fit to adopt a little baby. We had to tell her that Jason had no job. Not only did he have NO job, he lost a job he really loved. He had been working in a clinic far away from home since leaving residency. His hands were tied and it was not his clinic. The drive seemed longer and longer each week. When a local doctor ask him to join his practice, we were shocked! We prayed, sought advice, and prayed some more. With much enthusiasm he agreed to join the practice as an employee first, and then hope to buy into the practice after a year. It was his dream job. He loved pediatrics. He loved the office setting. The hours were perfect for our family! It even had the potential of being financially stable. When he first started business was slower than expected, but we were never given any indication that this was a problem. Until that day nine months later. It was Friday. He was told to clean out his desk and not worry about coming in on Monday. As the days went by, we went through all the stages of loss: sadness, anger, disbelief, confusion. We did not understand. Why would God seemingly move us here, only to close the door on our faces? Until we began to pray. "When I thought how to understand this, it was too painful for me - until I went into the sanctuary of God; then I understood their end." We remembered. Only four months before that we had done something we had never done before. It started with me thinking about our future. I began to think about missions. We had always said that we felt God pulling our hearts toward missions, but never toward any particular place. Because Jason still had school loans, we never felt it right to start truly pursing missions until those were paid off. In November of last year, I began to see that if Jason were to buy into this practice, we would have little if no freedom for mission work. He would be tied down and obligated to work the majority of the year - investing his time, money, and energy into building his practice. Jason and I decided to spend the month of November fasting and praying for direction. We asked the Lord specifically to close the door if this was not His will. At the end of the month, we did not hear a voice from heaven or come up with a good reason not to move forward with his current job. So we stayed the course. 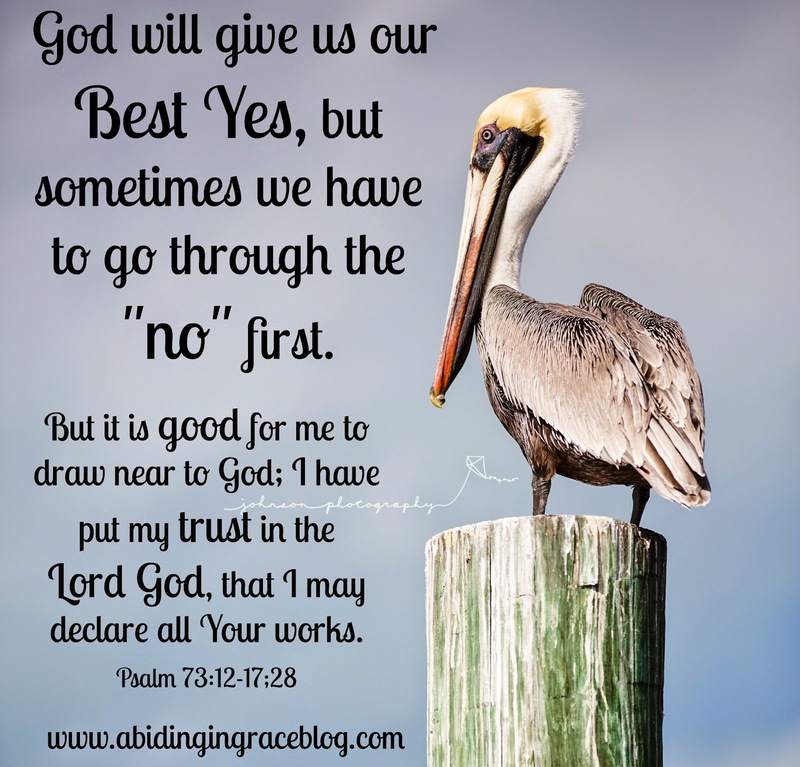 We assumed God had answered with a YES. Fast forward to January 31. God was going to answer our question from November with a ......NO. We questioned why God moved us to the private practice here in town, only to move us again nine months later. One conclusion we have come to is the fact that Jason would have never left his first job to be in the current job. Another conclusion is the fact that God works in ways that we cannot understand. We simply cannot know. Another conclusion is that God wanted to teach us about provision. He wanted to prove to us that HE was going to provide for our family - not a job. God showed us that reassuring truth of His provision over and over again. The biggest worry with a job loss is financial stability. Thankfully, God had prepared us. We had saved a little for a "rainy day" fund. Miraculously we even were able to continue making adoption payments without going into debt. We are so grateful to God for providing our needs. We see His hand so clearly in this. We thought that maybe last year we jumped into this private practice too early. Instead, we've decided that God used it as a stepping stone to get Jason where he is now. We are amazed at how God worked everything out. Jason's current job has great hours (although a little unconventional). We've had to adjust our routine, but after four months we are now settling down into a routine. Not only does he love his job, it provides us with a lot of freedom to invest in missions as well. God has us exactly where He wants us. If He moves us again, we know from experience that He will take care of us and provide. 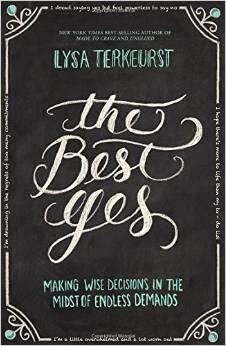 Lysa Terkeurst's book "The Best Yes"
provides readers with a how-to-book in making wise decisions. Check out TheBestYes(dot)com as well!